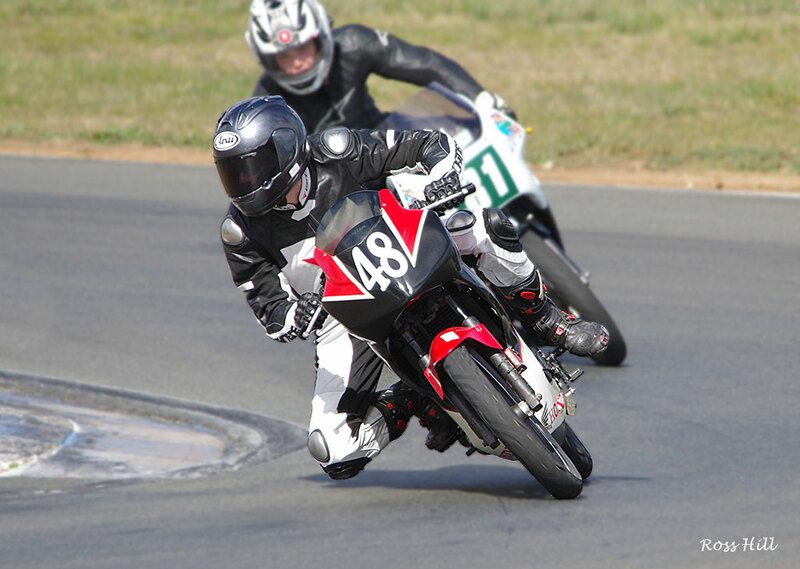 #77 Tyler Bradford dominated the 2014 Motolite Championship running a well sorted Big bang Engines Honda 150. 32 Marty McGauley on his Honda cr85 scored points at every meeting to finish 3rd in Motolite Championship. 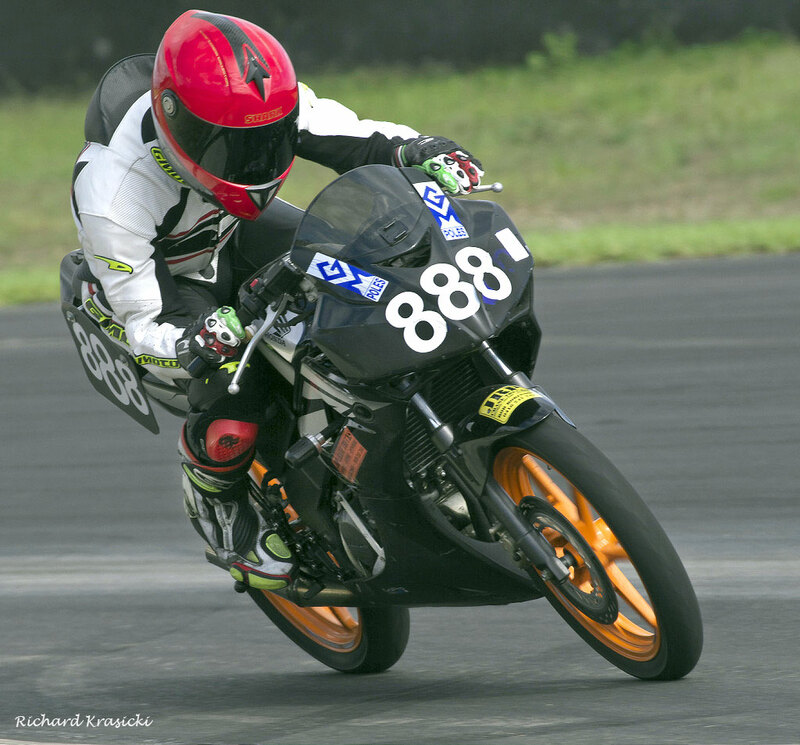 11 Michael McLean had a great season on his CBR150 gaining 4th in the Motolite Championship. 18 Brian Mowle on his CBR150 finished 5th. in the Motolite Championship. 169 Ian Gregory finished 2nd in the championship fought many battles with Junior Murphy but a few DNFs cost him valuable points. #2 Ken Lindsay had a solid year scoring points in all races to finish Third in the Championship. 65 Tim Smith finished 4th in the Superlite PRO Championship. Unlucky in the end to have a DNF in the final round. 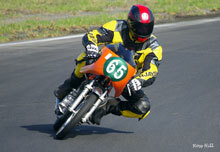 62 Jim Murphy had a consistent year to finish runner up in the championship. #31 Duncan Taylor had a great year scoring points and winning the wet round two. Third in the championship was a well deserved result for this Canberra rider. 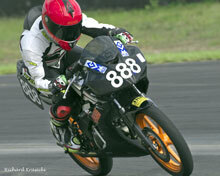 #8 Kurt Wagus missed out on two race meetings but was on the pace winning six out of the nine races he contested. He finish fourth in the championship. #181 Glenn Tisdell finished fifth on his quick Suzuki 150. He was very competitive but a poor finishing record damaged his championship aspirations. #136 Ron Pulido held off a late charge by Nicolas Wenban to win the first ever Commuterlite Pro Championship. 48 Nicolas Wenban finished runner up in the championship after putting together an impressive string of wins. 888 Jack Robinson finished 3rd in the Championship. A few DNFs blunted his challenge. #16 Robert Young introduced the KTM125 mid season to finish fourth in the championship. #17 Adam Cameron scored nine race wins plus four podiums and went on to win the first ever Commuterlite AM Championship in his rookie year. 73 Oliver Higgins runner up in the championship after some excellent performance's through the year. 13 Andrew Martin in his rookie year was on the pace but two DNFs hurt his challenge. 104 Ron Wenban put in some strong performance's to finish 4th in the Championship. 40 Richard Cook points score tied with Ron Wenban but Ron got 4th place by dint of a higher podium count. 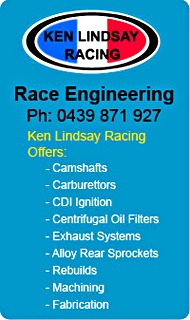 Race Report PCRA/BRA Round 6 Wakefield Park. The final Round of the PCRA Bucket Racing Championships was held at Wakefield Park on Saturday 30th August on a bleak bitterly cold Winters day. The five bucket championships produced close racing all year and the final meeting didn't disappoint. Forty plus Bucket Racers get under way in race one at round six at Wakefield Park. #77 Tyler Bradford already with a good lead went on to win race one. Coming to the final round #77 Tyler Bradford (BBE CBR150) had a commanding seventy five point lead making him the 2014 Motolite champion. 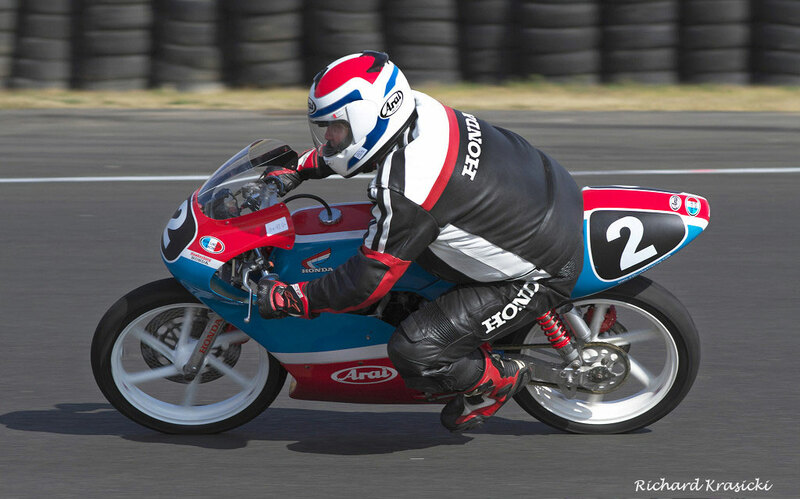 #28 Jack McGauley (Honda RS85cr), Tyler's nearest challenger had a lot of podium finishes but no wins so even if Tyler no scored and Jack won all three races Tyler was still the championship winner because of his greater number of wins. To make it a family affair Jacks dad #32 Marty McGauley (Honda CR85) was third and Anthony Marsden fourth. 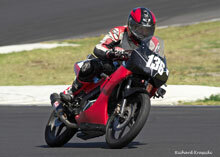 (did not compete in final round) and #11 Michael McLean (Honda CBR150) fifth. Raymond Skidmore #79 being pushed hard by the 2014 Motolite champion #77 Tyler Bradford. Raymond won the day with 2 wins and a second. Due to timing problems while qualifying the grid was a bit mixed up with some riders out of place, however everyone slotted into their usual order once racing got under way. The blue #77 Tyler Bradford (BBE CBR150) went into the lead to win race one convincingly. #79 Raymond Skidmore (Honda RS 150) fought his way through from a low grid spot to finish second and pushing Jack McGauley into third. 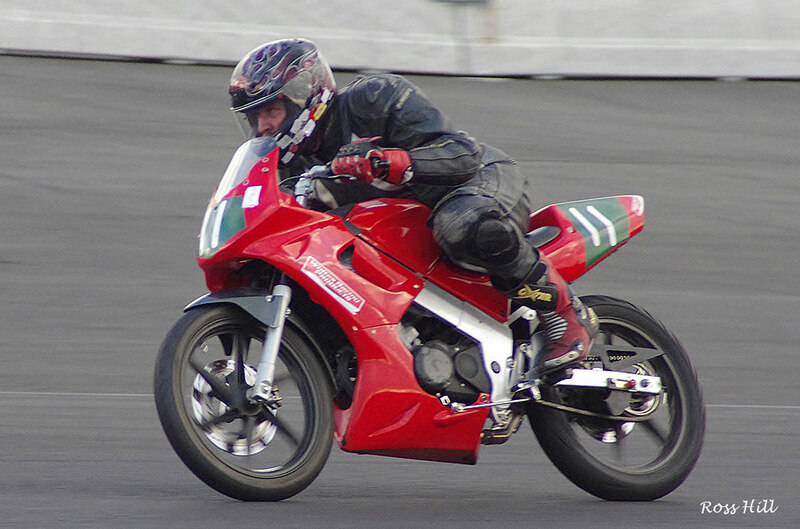 Next up came the evergreen #42 Andrew de Jersey (Honda CB200) in fourth. followed by #94 John Olip (Moriwaki 85) in fifth place with #18 Brian Mowle (Honda CBR150) sixth and #22 Jeff Angel (Moriwaki80) seventh. 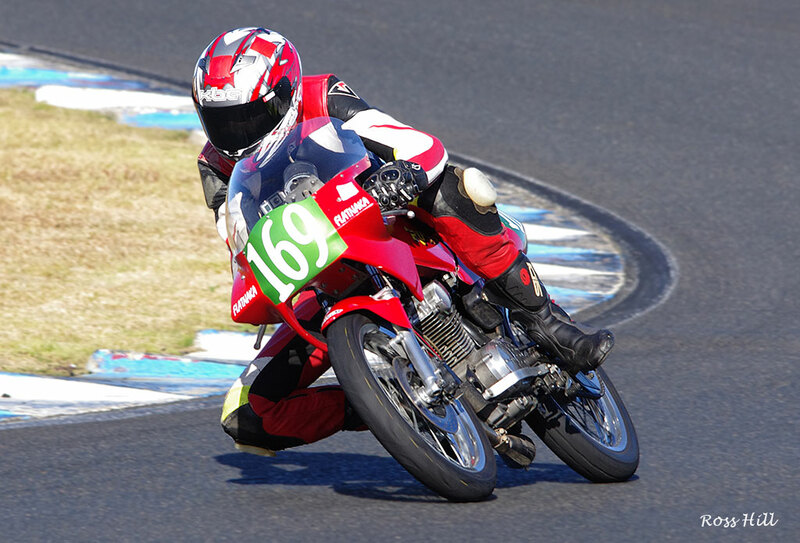 Number 11 Michael McLean (Honda CBR150) finished in eight place moving himself into fourth place in the championship. Next up came #32 Marty McGauley (Honda CR85) ninth and #170 Michael Child (Supermono 197) came home tenth. Race 2 saw #79 Raymond Skidmore pass Tyler Bradford on lap two and went on to a well judged win over Tyler. Jack McCauley came in third with Andrew de Jersey fourth. John Olip who was running in a strong fifth place suddenly dropped back down to eight due to some problem. 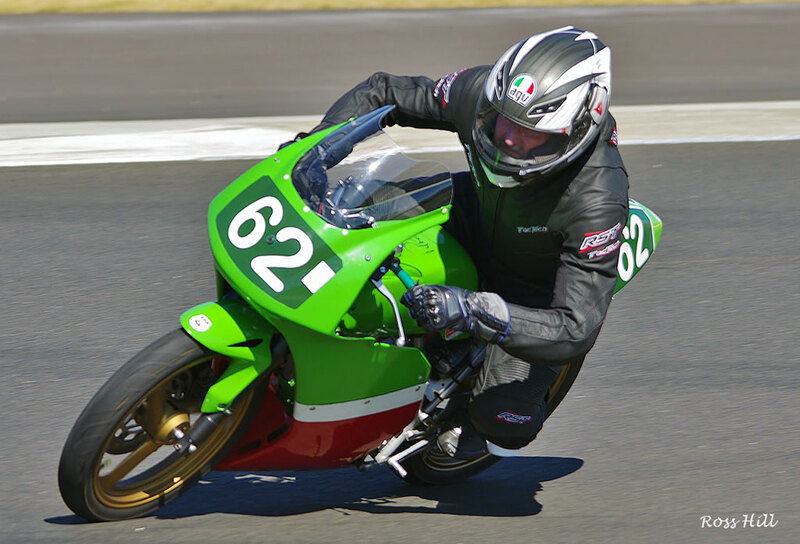 Brian Mowle continued his good form with another sixth place and Michael McLean consolidated his points score for fourth place in the championship by finishing seventh. John Olip managed to limp across the line in eight with #170 Michael Child coming in ninth . Race 3 was a carbon copy of the previous race with Ray Skidmore winning by .5 sec. with the finishing order as in race two. This year Tyler Bradford on his finely honed ex Garry Briggs Blue Harvest Pools Big Bang Engine Honda 150 has been outstanding for speed and consistency. He won eight races this season and was on the podium for the remaining seven races. 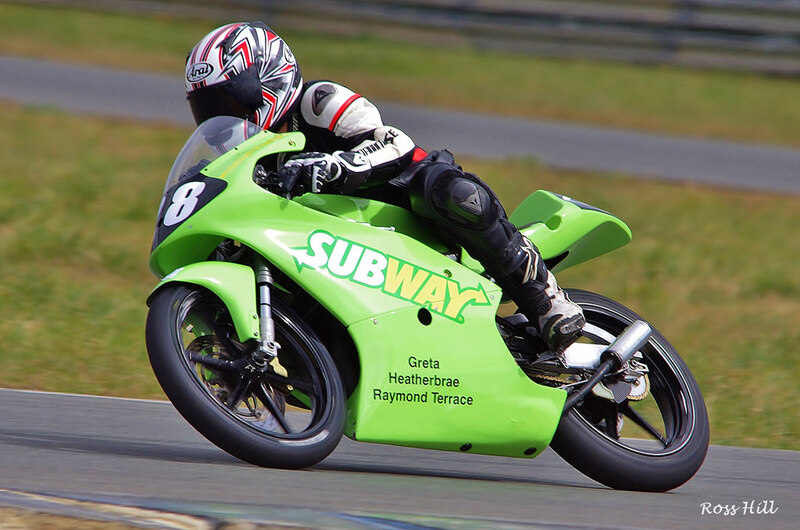 Up and coming Jack McGauley on his Subway sponsored Honda RS85cr was Tyler's nearest challenger. Jack is improving on every outing, just needs to make that final step up on the podium. No doubt it will come. Keeping it in the family Marty McGauley scored good points in every race. 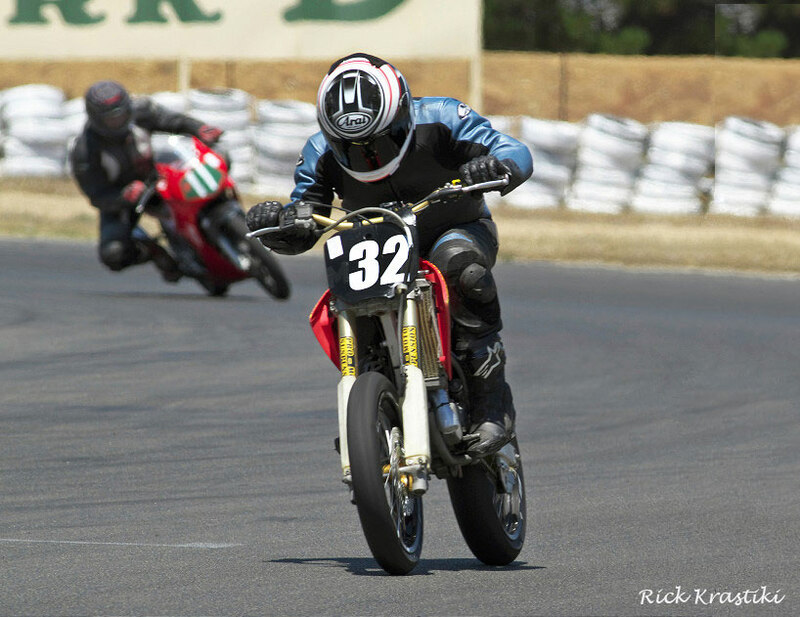 He came in a fine third riding the Supermoto style Honda CR85. 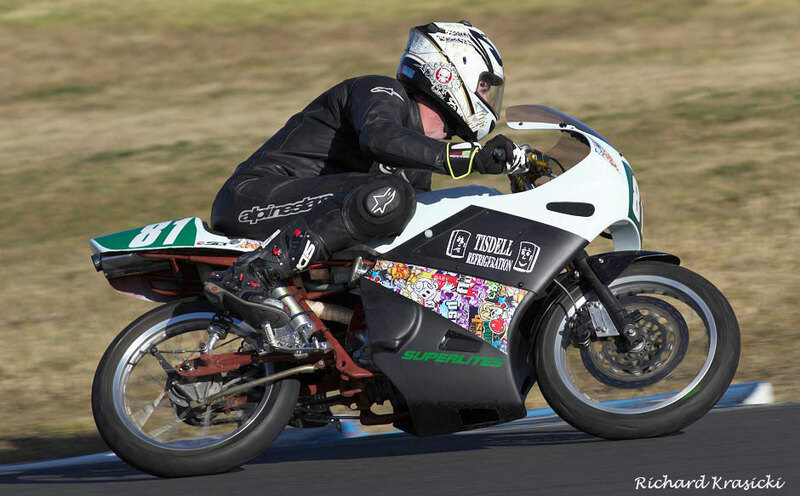 Riding the wheels off of his bog standard CBR150 the hard charging Michael McLean moved up to fourth in the championship in the final meeting. 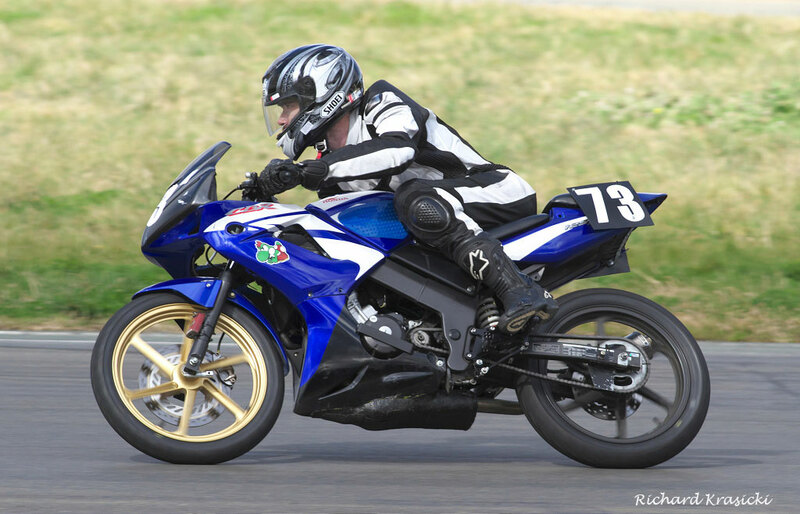 After having his CBR150 tweaked mid season a very much in form Brian Mowle leaped up the finishing order to net fifth place in the championship. Coming into the final round the Superlite PRO championship had #38 Junior Murphy (BBE Honda CB150) leading from #65 Tim Smith (Honda CB150) by thirty four points with #169 Ian Gregory (Honda CB150) a further seventeen points behind and #2 Ken Lindsay (KLR Honda RCB150) four points off of Ian. With seventy five points up for grabs it was still anyone's championship. Race one was restarted after a first corner incident which would see second placed championship contender #65 Tim Smith not get to the restart and taking him out of the championship equation. 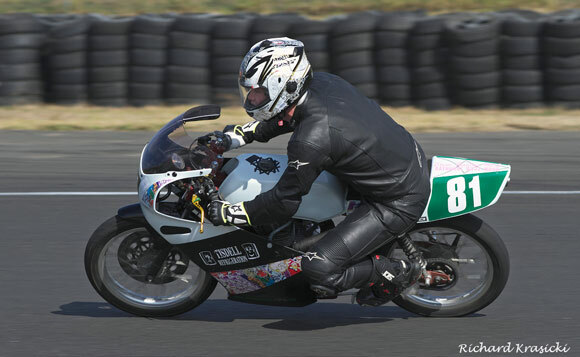 #80 Lyle Bennett on the fast but fragile (Honda H100) got the hole-shot and was never headed. 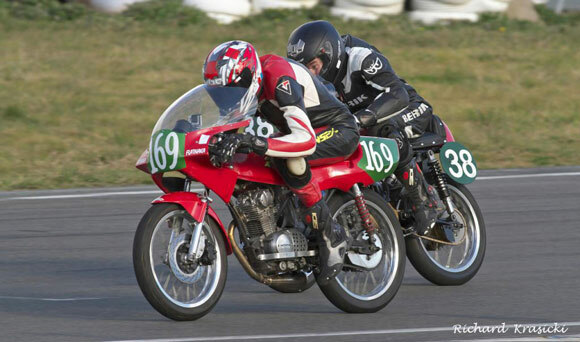 #169 Ian Gregory (Honda CB150) and #38 Junior Murphy (BBE Honda CB150) were locked together as they have been the whole year with Ian making the decisive move on Lap three and holding second place to the end. Junior was third and #2 Ken Lindsay (KLR Honda RCB150) came in fourth. Race two. With the #80 Lyle Bennett machine not on the start grid (ignition problems) and #65 Tim Smith starting at the rear of the 40 odd bike grid, Junior only needed to finish to retain the championship. Ian got the hole-shot but Junior was not letting him get away and snatched the lead on lap three. Ian wasn't having any of it and getting a better run out of the last corner won the drag to the line. #2 Ken Lindsay finished third and #65 Tim Smith having battled his way through the hordes of CommuterLites came in fourth giving him a better grid position for the final race. Race three the final race and #38 Junior Murphy and #169 Ian Gregory once again locked in battle, it came down to the last corner and the drag to the line had Ian getting the verdict by .08 of a sec. #2 Ken Lindsay again came in third and finishing in third place in the championship. #65 Tim Smith came in fourth and fourth in the championship. 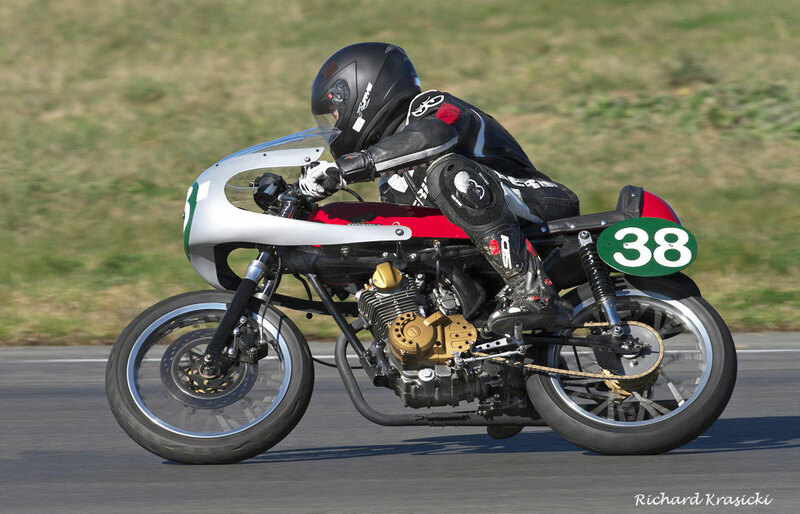 With five wins this season and being on the podium for the rest of the races Junior riding his distinctive Honda 60s style racer with Big bang engine proved hard to beat for speed and consistency. Although Ian had the speed shown by his six wins and podium finishes a couple of DNFs ruined his chances. Ian has been runner up for the past four years surely next year will be his time. By finishing third in the 2014 Superlite Pro championship King Kenny maintains his record of finishing in the top three for 14 of the past 15 years. Ken has five Superlite PRO championship crowns won in that period. Tim Smith travels from Orange to all the meetings and has been a Superlite class supporter for many years. This year Tim mounted a formidable challenge for the title with 3 wins and many podiums. Coming into the last round Tim was in second place in the championship albeit 34 points down but a DNF in race one pushed him back to fourth one point behind Ken Lindsay (third). With reliability so good now any DNFs are fatal for championship contenders. No doubt Tim will be back with renewed vigour next year. The Superlite Amateur class came to the final meeting with #81 Robert Tisdell (Honda CB150) trailing #62 Jim Murphy (BBE Honda CB150) by eleven points with #31 Duncan Taylor (Kawasaki KH100) seventeen points further back and #8 Kurt Wagus (BBE Honda CB150) just one point behind Duncan. 81 Robert Tisdell was in devastating form winning all three races and clinching the championship in the very last race. Race one start was a disaster for #8 Kurt Wagus as he went down with nowhere to go when another bike crashed out right in front of him. The red flag came out. Kurt's bike was too damaged to continue. One contender out before one lap completed. The restart saw a very determined Robert Tisdell jump into the lead as he knew he had to win the 3 races to win the championship. Robert held on to win from #62 Jim Murphy second and #181 Glenn Tisdell (Suzuki150) third. 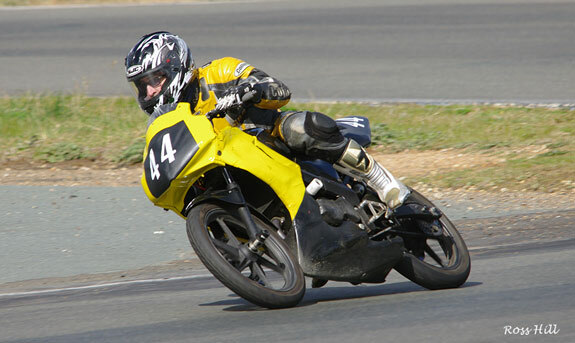 Wildcard #43 Dan Harrison (Honda CB150) was fourth. followed home by #31 Duncan Taylor (Kawasaki KH100) and #164 Darrell Francis (Honda CB150). Again in race two #81 Robert Tisdell got a great start raced to a flag to flag win, but Jim Murphy was pushed back to third by #43 Dan Harrison on lap three. #31 Duncan Taylor came in fourth and with #181 Glenn Tisdell retiring from race two Duncans third place in the championship was assured. Murphy's championship lead was down to three points and it looked like Robert was on a roll. And so it was #81 Robert Tisdell (Honda CB150) made no mistake winning comfortably and clinching the Superlite AM championship by two points in the final race of the series. That's as close as it gets. #43 Dan Harrison again finished second and #62 Jim Murphy third. 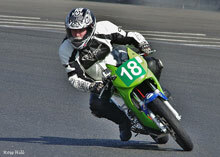 Duncan Taylor came in fourth on the lone Kawasaki two stroke to claim third place in the Championship. #164 Darrell Francis came home fifth. on the day and sixth in the Championship. 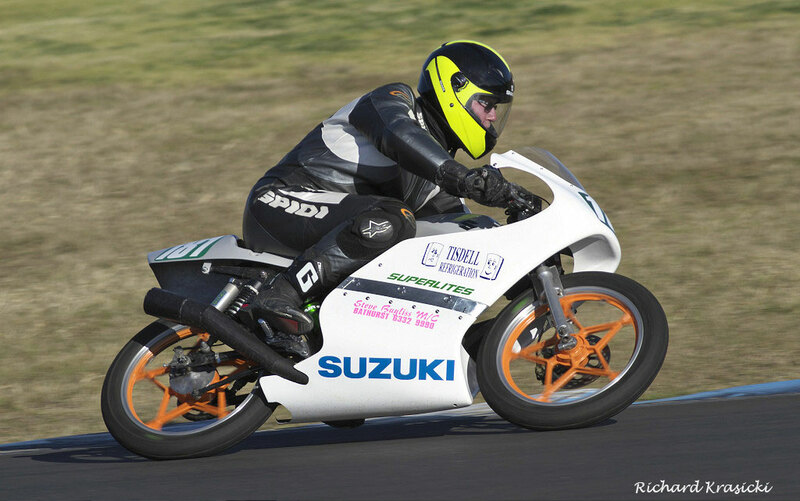 Despite missing the first round of the championship Robert Tisdell rode fast and consistent throughout the season keeping his eye on the prize and waited for the final race of the year to clinch the Championship. That's cutting it close. Robert had seven wins and six podiums. It's a well deserved result for the Bathurst rider. Jim Murphy had one win ten podiums and finished all fifteen races He led the championship for most of the year. Lost by two points in the very last race. That's racing! #31 Duncan Taylor from Canberra campaigns a Kawasaki KH100 which he put to good use. At the very wet round two Duncan scored a win and a third propelling him up to second in the championship at that time. He finished a well deserved third in the championship. Fourth place finisher Kurt Wagus had 6 wins, 3 podiums and was a strong contender even though he missed round three. Not being able to start in the final round due to bike damage put paid to his title challenge. The final round of the Commuterlite Pro championship saw #136 Ron Pulido (CBR125) having a twenty point lead over #48 Nicolas Wenban (Honda CBR125) who in turn had a ten point advantage over #888 Jack Robinson (CBR125). The Championship was Ron's to lose but as long as he finished in the first four he was OK. Ron and Jack had to win and hope Ron had a bad result. 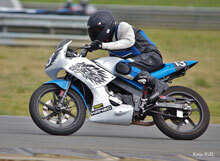 Queenslander #44 Mark Strong won round six Commuterlite Pro class with two wins and a third. Ron Pulido won the Championship. Race two saw #44 Mark Strong have a flag to flag win with Nicolas Wenban second. This time #88 Leanne Nelson was never in the hunt as some gremlins struck her little Honda and she retired after completing two laps. A great battle for third between #888 Jack Robinson and #136 Ron Pulido ended in Jacks favour. Ron now was close to the title all he had to do was finish the next race and he was Champion. Race Three again saw #44 Mark Strong tear into a solid lead but this time Nicolas kept much closer. Disaster for #888 Jack Robinson he didn't make the start due to some technical issues with his machine, what a shame after such a strong season for it to end this way. All eyes were on Ron Pulido third initially, on lap two he was passed by Leanne Nelson but he stayed out of trouble to come home fourth and clinch the 2014 Commuterlite PRO title by a margin of eight points. 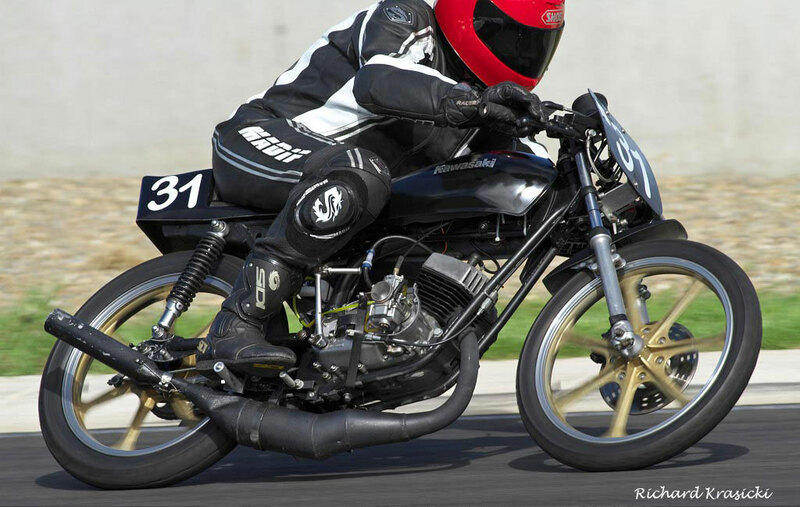 The Commuterlite PRO class put on some close and exciting racing throughout the year. This year Ron Pulido rode fast and consistent putting his crasher reputation behind him. 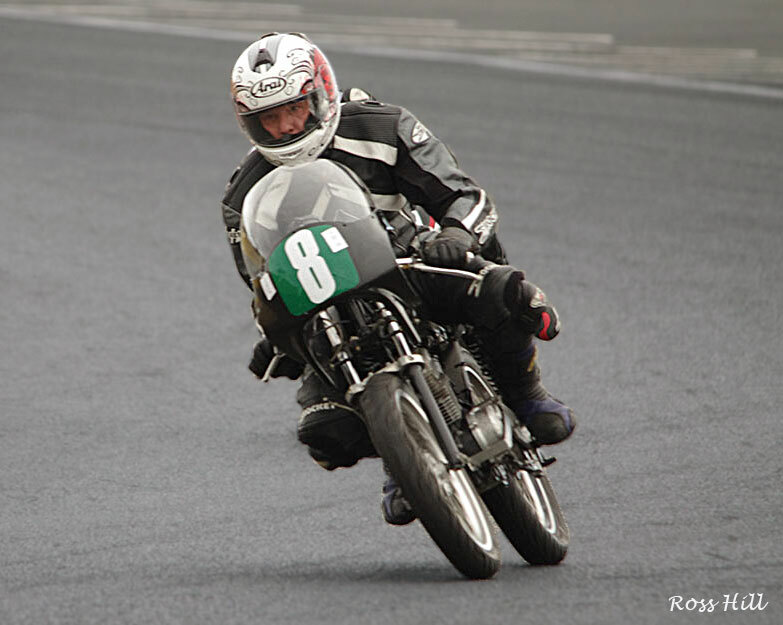 Ron won the Commuterlite PRO championship by eight points. Nearest challenger Nicolas Wenban got close, stringing seven consecutive wins together but lost out in the end by those eight points. Third in the championship 888 Jack Robinson came into the final round looking to improve should Ron or Nicolas falter but a DNF in Race three at Wakefield Park cost him but he retained his third place. 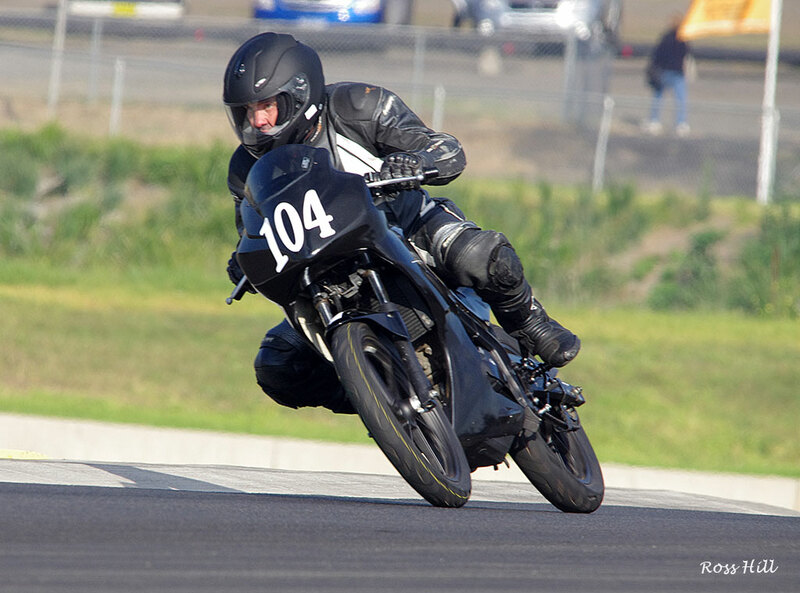 Fourth in the championship, Commuterlite stalwart from the beginning of the class Robert Young had a steady season. Half way through the season he introduced the KTM125 and is steadily improving it. Should be sorted for next year. Nice to see something different on the grid other than the hordes of Honda CBR125's. 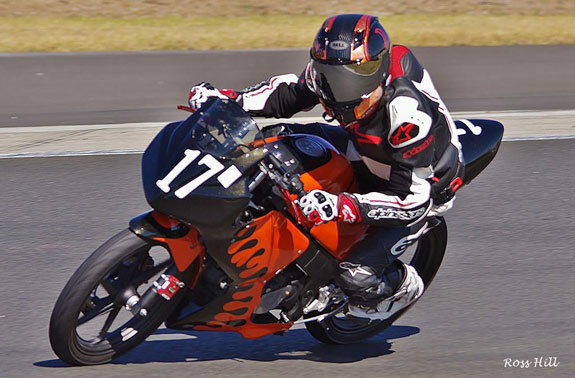 Once again it was business as usual for #17 Adam Cameron (Honda CBR125) winning two races and second in the third, clinching the overall win for the day and the Commuterlite AM championship. After a fierce battle with #13 Andrew Martin (Honda CBR125) Adam had to give best in race three. Andrew Martin finished second overall in the day with #104 Ron Wenban (CBR125) third. Adam Cameron 17 won the final Championship round and the 2014 Commuterlite AM Championship. In the final race of the day race three he had to give best to the ever persistent #13 Andrew Martin. Race one had the #17 Adam Cameron (Honda CBR125) machine out in front with a hotly contested battle for second place between #104 Ron Wenban (CBR125), #13 Andrew Martin (Honda CBR125) and #40 Richard Cook (Honda CBR125) finishing in the that order. 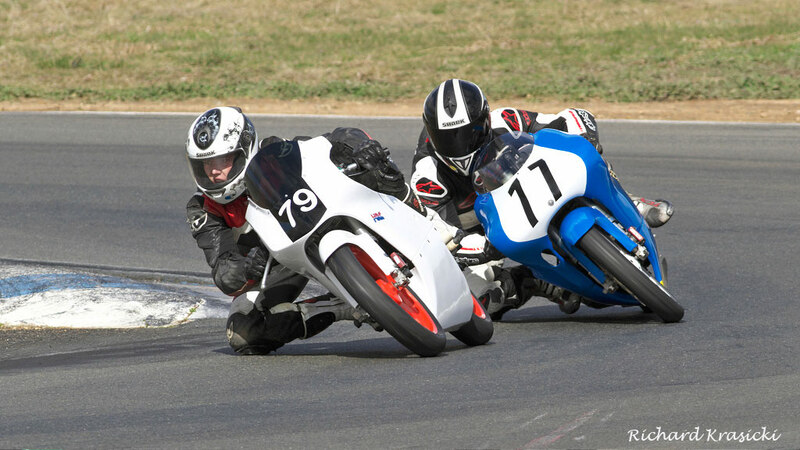 Race two again had Adam Cameron comfortably out in front being chased by a fast improving #82 Corey Smith (Honda CBR125) with #104 Ron Wenban a gnats whisker behind. A trio of riders #40 Richard Cook, #13 Andrew Martin and Jason Blanch were locked in battle swapping places every lap finishing fourth fifth and sixth covered by the proverbial blanket. Race three looked like more of the same with the orange #17 machine flashing into the lead but #13 Andrew Martin had other ideas and took the lead on the last lap from a surprised Adam Cameron, to win the last race of the 2014 Commuterlite AM championship. 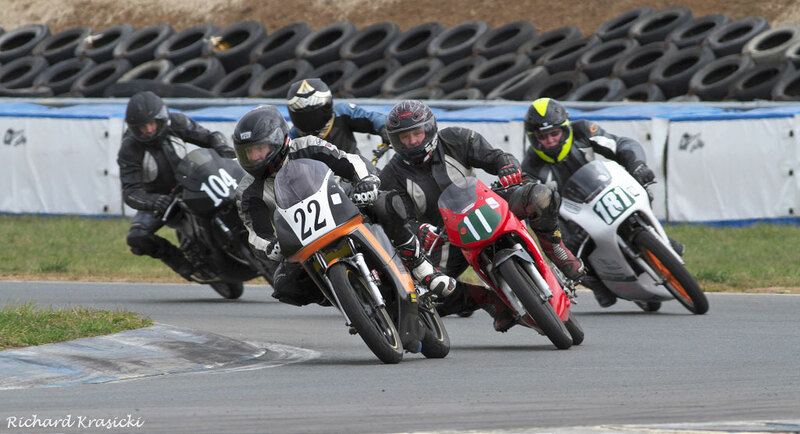 Behind this duo a long string of CommuterLites were doing battle (Moto3 eat your heart out) finishing in the following order 82 Corey Smith, #40 Richard Cook, #73 Oliver Higgins, #10 Jason Blanch, #222 Fil Pulido, #92 Julie Klinker, #555 Nicholas Miller, #26 Anthony Vassallo, #131 Rez Pulido, #16 Robert Young (KTM125), and #108 Frank Loveridge. 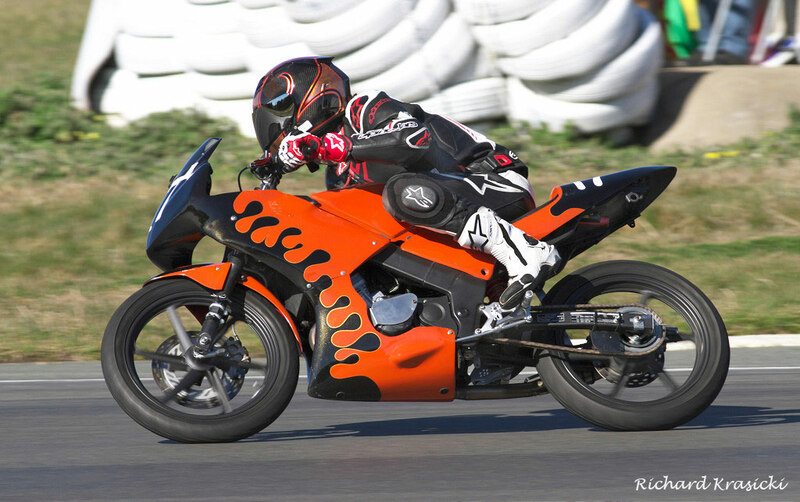 Adam Cameron riding the well turned out Orange Honda CBR125 was the stand out rider in the Commuterlite AM class. In his rookie year he dominated the class with nine wins, plus four podiums finishing all of the fiftheen races. 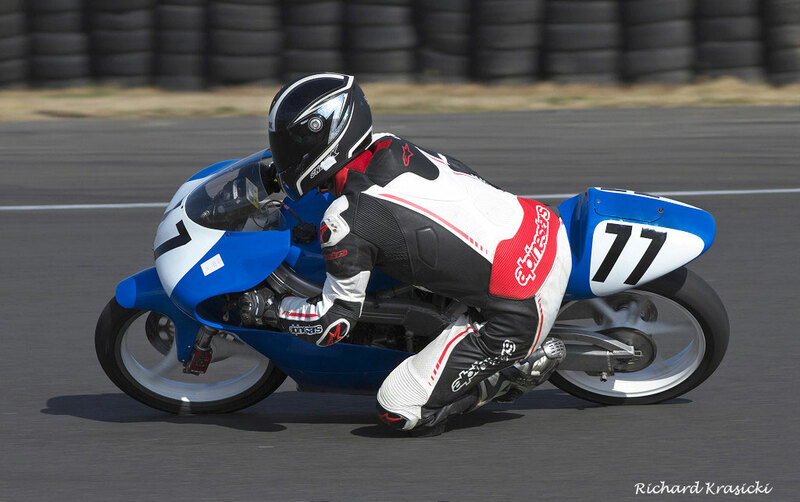 Runner up #73 Oliver Higgins (CBR125) started the year in great form and with two wins under his belt was tied with Adam Cameron for the championship lead at round three but various bike maladies causing poor results hurt his final points score. Even so Oliver managed to finish all fiftheen races gaining valuable points and securing a fine second place in the Championship. Third placed championship rider #13 Andrew Martin (Honda CBR125) was also another newcomer to the Commuterlite AM class and showed a great turn of speed winning two races and being on or close to the podium in the races he finished. 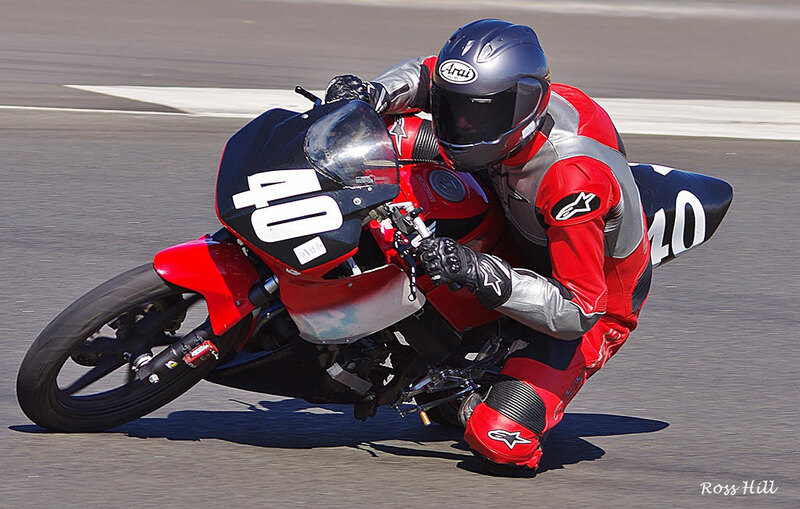 However two DNFs blunted his challenge, Andrew is a rider to watch in the future. 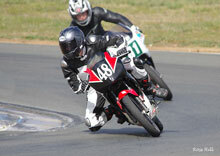 There is no doubt that the Commuterlite classes encourage riders young and old to give road racing a go. 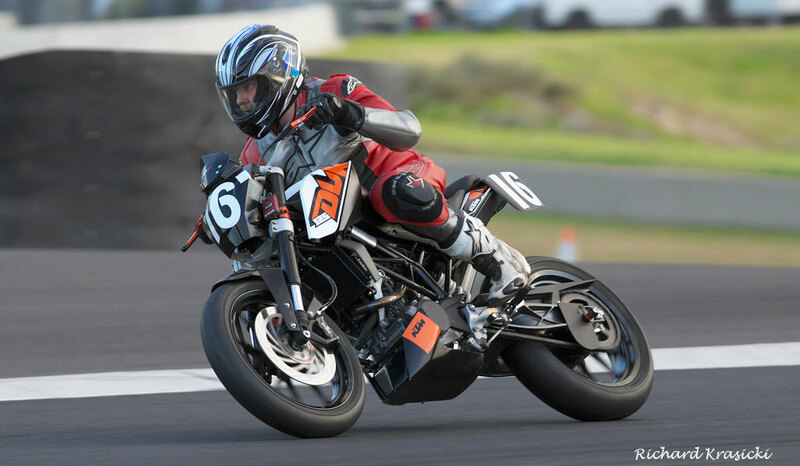 The introduction of the AM class to Commuterlites has been a huge success and in its inaugural year had more bikes on grid surpassing the other Bucket classes. With the faster riders from the AM class moving up to the Commuterlite PRO's next year good entries and close racing is ensured in both Commuterlite classes. Typical of the dicing in Bucket racing, always close and a lot of fun. Here #22 Jeff Angel leads #11 Michael Mclean, #181 Glenn Tisdell, #32 Marty McGauley and #104 Ron Wenban.